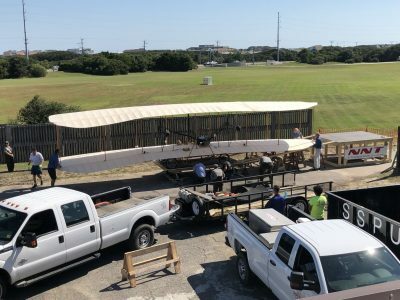 Wright Brothers National Memorial, WBNM, welcomes its 1903 Wright Flyer “home” as the visitor center exhibit installation and building rehabilitation enters the home stretch toward the Grand Re-opening October 20, 2018. The visitor center re-opens October 20th 9:00 am-5:00 pm (WBNM park operating hours) after a two year, $5.5 million, rehabilitation that included electrical, HVAC, and plumbing work adhering to architectural and historical preservation measures of the building’s original construction. Additionally, the 1960 building welcomes $1.5 million of new exhibits with the capstone return of the Wright Flyer. The admission fee is waived for this special event day. The Flyer was hosted and displayed by the NC Museum of History in Raleigh, NC during the rehabilitation. The Foundation funded the $33,000 structural engineering and equipment installation for this exhibition. The Flyer left the museum early June 2018 to return to northern Virginia for refurbishment by the Wright Experience, the builders of this reproduction, which was commissioned by the late Harry Combs as a gift to WBNM for the 2003 Centennial. The transition from the truck into the building took 11 minutes 38 seconds aboard a rail junction and moveable platform. A temporary wall came down, the Flyer went in, and a new permanent window and frame went in. The Flyer faces the north, the direction of flight Dec. 17th, 1903, and mirrors the First Flight line to its west visible through the windows. It is the feature of a revamped Flight Room and sits above a sand feature platform with a circular interpretive rail and to its north is a 16 panel video wall showing historical images and video clips. WBNM is a member of the Outer Banks Group of the National Park Service for Eastern North Carolina, nps.gov/wrbr.